"...According to Jewish traditions, Melchizedek is Shem, the son of Noah, whom God consecrated to be a priest for ever, and who set up a kingdom on Salem. "1 Included in his book on the Legends of Old Testament Characters, the Reverend Sabing Baring-Gould includes a quotation from the Targumim, stating, "Melchizedek, who was Shem, son of Noah, king of Jerusalem. "2 Louis Ginzberg continues this tradition, in his Legends of the Bible (a condensed version of the 7-volume Legends of the Jews), stating that "when Abraham returned from the war, Shem, or, as he is sometimes called, Melchizedek, the king of righteousness, priest of God Most High, and king of Jerusalem, came forth to meet him with bread and wine. "3 More recently, scholars Raphael Patai and Robert Graves note that, "others again say that Melchizedek (also known as Adoni-Zedek), was Abram's ancestor Shem, and that he now taught Abram the duties of priesthood..."4 Numerous other historical Jewish sources confirm this same teaching. Shem's inheritance included the land of Salem, and Melchizedek was the king of Salem. Shem "reigned in righteousness" and Melchizedek's name means "king of righteousness." Shem was the great high priest of his day. Abraham honored the high priest Melchizedek by paying him tithes and seeking blessings at his hand. Abraham stands next to Shem in the patriarchal order of the priesthood and would likely have received the priesthood from him, but according to D&C 84:5-7, Abraham received the priesthood from Melchizedek. Jewish tradition identifies Shem as Melchizedek. President Joseph F. Smith's vision of the Redemption of the Dead (D&C 138), names Shem among the great patriarchs, but there is no mention of Melchizedek. It is clear that with the diversity of opinion on the matter, that no definitive revelation has yet been received. As such, the scriptures are sought for further understanding, and where helpful, supplemental sources provide unique insights. The Rabbins [Rabbi's] identified Melchisedech with Sem, son of Noe, rather for polemic than historic reasons, since they wished to set themselves against what is said of him as a type of Christ "without father, without mother, without genealogy" (He., vii, 3). Interestingly, an early Jewish source, Flavius Josephus is completely silent regarding any connection between Shem and Melchizedek. Whatever the connection is, it remains a mystery. As stated by Alma Gygi, "all of this provokes some questions and calls for answers. Were there two high priests presiding at the same time? Why is the record silent concerning Shem's ministry? 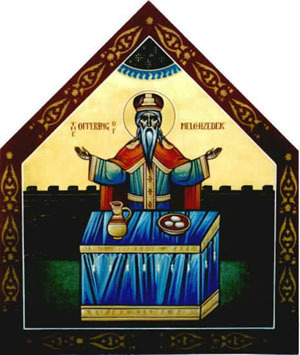 Why is nothing known concerning Melchizedek's ancestry? Because of this state of knowledge on our part, many Saints and gospel scholars have wondered if these men were the same person. The truth is, we do not know the answer. "15 When the answer comes, it should satisfy the arguments on either side of the matter. The problem lies in the D&C with the known gapping of giving the priesthood to this individual. Even thought all these years it was Shem. But giving to research and thorough prayers, this is not the case. At that time, brother of Abraham, Aram's children did occupy the land of Canaan and Egypt. The semantic people migrated west and the rest is history. This is why Abraham was welcome to this area and Egypt. I suppose I could have spent more time on D&C 84, but as it was mentioned by Alma Gygi, as well as Elder McConkie (both pro and con). For a long time I believed Melchizedek was Shem, despite D&C 84, because I believe it could be interpreted both to support the idea, and to dismiss the notion, however, the latter, seems to have a stronger case. The concept that changed my position on the matter was Douglas Clark's comment that Shem was seen in the spirit world (D&C 138), but Melchizedek, who had been translated, was not mentioned in the Spirit World, nor was any other translated being. I don't believe the matter is finalized with this, but it did convince me to reconsider my position. 1. The Melchizedek Tradition: A Critical Examination of the Sources to the Fifth Century A.D. and in the Epistle to the Hebrews, by Fred L. Horton, Jr (Cambridge University Press, Cambridge, MA, 1976). 2. Tradtions of the Bible: A Guide to the Bible as it was at the Start of the Common Era, by James L. Kugel (Harvard University Press, Cambridge, MA, 1999). Tim... verrry interesting. A couple of quick comments and questions. You mention that you changed your mind after reading that Pres JFS saw Shem in the spirit world but not Melchizedek. I am wondering if this necessitates a preclusion that the two names represent one identity. First, can translated beings dwell in or visit the spirit world? ... if "no" then that settles it, but if yes, the question remains open. Second, the fact that Shem is mentioned as being there but Melchizedek is not merely begs the question, since that is the very question at hand ... were they the same? This fact does not weigh on the matter in my opinion. Third, I believe to be "buried by the hand of the Lord" may be an allowed euphemism that could intend translation, as in Moses' case (see Alma 45:19), and so notwithstanding the fact that the JST retains a mention of Shem's death, he could still have been translated. Finally, that no unambiguously translated being was seen in JFS's vision may mean absolutely nothing, since literally scores upon scores of important scriptural figures who died natural deaths were also never mentioned, and their omission matters little. Perhaps the same could be said for Elijah, John, etc. Anonymous - thank you for your comment. As it turns out, I may have been a bit too hasty. I thought E. Douglas Clark may have provided the solution, until after your comment I did a little more home work and realized that Moses, who was translated, was seen in the Spirit World - D&C 138:41. As such, it appears reasonable that Shem and Melchizedek could be the same person, however, it is interesting to note that Shem died in the Bible, unchanged by the JST, whereas Melchizedek was translated. You mentioned Alma 45, and this could be the case for Melchizedek (and maybe others? ), but it looks like the matter remains a mystery until a revelation provides a final answer. Everybody knows that Melchizedek is Shem and that Shem is Black. He is the King and Highest Priest of the One Most High, the King of Jerusalem and the holder of the line. Anyone calling themselves Jew, is a simple usurper, who has used the cover of pseudo-academia to manipulate themselves into position. It is now clear why they are so racist against Black people who are the true descendants of the strongest heritage in the history of mankind. Bad news for them and their Black-hate scheme, but the rest of the enlightened world is ready for the Good News. God Bless every God-fearing Jesus-Christ-loving man and woman involved in Gods decent works. It is now time to Right the Wrongs. Anonymous - thank you for your post. While I'm not about to allow my blog to become a forum for name calling and racism, I posted your comment because you have made some assertions that need to be supported. First, not everybody knows that Melchizedek is Shem. Why do you believe that everybody knows this? Second, what evidence do you have to support the assertion that Shem is black? Third, while you call Jews "simple usurper[s]" you may have forgotten that the Jews are part of the covenant people, i.e., the seed of Abraham (the chosen lineage). I wouldn't be so cavalier about criticizing those with whom God has made covenants. On the other hand, it is also important to note that all of Israel's children are covenant people (not just Judah). Fourth, you state that the Jews use "pseudo-academia to manipulate themselves into position." Presumably, you mean that through scholarly methods they have attempted to identify Melchizedek as Shem, and therefore the seed of Noah, and Abraham's ancestor. Yet, as Kugel pointed out, they claimed this before the subject was ever even an issue. Do you have any evidence otherwise? If so, perhaps you would consider supporting your assertions with some evidence. Fifth, you claim that black people are descendants of the strongest heritage in history. Perhaps you can elaborate? I don't want to make any assumptions here as to what you are implying. If nothing else, please address question number 2 and 4, as they are the only issues relevant to the posted subject. Ha, Tim - you read and take from all the same sources I do! I should probably do more than glance at this article before commenting but I was going to mention and recommend (in my comment on your Skousen's atonement post in 2010) E. Douglas Clark's book "The Blessings of Abraham - becoming a zion people" (best on Abraham that I've found) and Alvin R. Dyer's talk on Genesis 10 to a bunch of missionaries in Canada sometime in the '60s I believe as items of interest. Both hugely influential upon me. I always want to tell everyone I know about E. Douglas Clark's book, but rarely do knowing most won't appreciate it the same way I did. I came away from that just awed by Abraham's hospitality more than anything and have thought to myself (probably partly because I served there) that the spirit of the south is the spirit of Abraham. Southern Hospitality. Very interested in what you have to say in this post now. Thanks for posting. Tim, I still stand convinced Shem and Melchizedek are two separate beings. Of course, I don't "know," but I'm holding to that for now. I could go on, but simply put this book is amazing in how much light it sheds on ancient, fragmented, and twisted history. Read it in full. Clark has anywhere from 100-150+ citations per chapter. The man has done his homework. The Lord only reveals so much, if you want to know more you can. We aren't gonna be spoon fed everything. He does expect us to study, to work at understanding, and He is generous to the honest seeker of truth. First, I appreciate your comments and thank you for taking the time to contribute. I have read Clark's book from cover to cover (including every footnote), and prize it as one of my favored books. 1. Clark relies on a chronology that is not accepted as canon. I'm not asserting that the Masoretic chronology is embraced by Mormonism, but we should be reluctant to conclude on matters where revelation hasn't provided answers. Clark seems to conclude by accepting a separate chronology without much reservation. 2. Clark asserts that Enoch probably gave Abraham the priesthood. However, there are actually two priesthoods here that he seems to have combined. D&C 107:52 indicates that Noah received the Patriarchal Priesthood from Methusaleh (see vs. 39-52 and TPJS, 40, where JS identifies the Patriarchal Priesthood as the Evangelical Priesthood), and receives the M.P. probably from Enoch (D&C 84:15; however, this verse is also ambiguous). Abraham on the other hand, may have received these priesthoods separately as well, but the scriptures are ambiguous on this too. Abraham received the M.P. from Melchizedek (D&C 84:14), but may have received the patriarchal priesthood from Jehovah (Abr 1:18; also see vs. 1-4, and Abr 2:8-12). Clark's assertion that it was Enoch is unsupported by scripture or General Authority's teachings. He seems to be extrapolating on JST Gen 14. 3. References to Josephus, Genesis Apocryphon, early Christians & Muslims are all problematic. The Genesis Apocryphon doesn't really add anything outside of Gen 14. In addition to the Genesis Apocryphon, which was part of the Dead Sea Scrolls, is 11Q13, or the 11QMelchizedek scroll, which Ann Madsen (Truman Madsen's wife) discussed in her Master's Thesis: Melchizedek, The Man and The Tradition (available online through BYU). The 11Q13 scroll identifies Melchizedek as a heavenly, redemptive being, rather than a mortal being. Joseph Smith corrected this idea - JST Gen 14:25-40, and JST Heb 7. Josephus first claimed that Melchizedek was a Canaanite and that he founded Jerusalem - both points are hotly contested. The Koran and early Islamic exegesis do not mention Melchizedek, so I don't think Clark's point here is valid. Early Christians seem to interpret Melchizedek's identity in a variety of ways (Melchizedek XI in the Nag Hammadi Library also makes him a heavenly figure identified as Christ). On the other hand, some early Jewish sources, such as the Targums, do identify Melchizedek as Shem. Kugel believes this argument preceded any controversy. Madsen seems to think otherwise (pg 58 of her thesis). The long and short of it is that Clark has pointed out that early sources do not connect Shem and Melchizedek, which is true of the Genesis Apocryphon, Josephus, 11Q13, Philo, and Melchizedek XI (Nag Hammadi Library); however, the Targums do, which are contemporary with some of these sources. All of these documents, however, are potentially two-thousand years removed from Melchizedek's life, and will not provide us with a solid answer. Joseph Smith provides us with the most insight regarding Melchizedek, but never mentioned Shem in his teachings, other than chronology in the Lectures on Faith (whose authorship is also suspect). Hence, the subject remains a mystery. I am still undecided on the matter. I'm not trying to discount Clark's knowledge and his remarkable book, I'm just trying to point out that this particular subject is not quite as easy as it seems, and Clark's summary here seems to over simplify the matter. i thought i might add you stated that shem was mention in D&C 138, but so was Moses who didn't die as well. so shem could still indeed be Melchizedek in E. Douglas Clark commentes. Hello Anonymous - thanks for the comment. I also realized my mistake, as well as Clark's mistake in this, as he asserts that Moses was not seen in the Spirit World; however, as you note, in D&C 138 he is seen. I've got this information wrong in the body of the post, however, see my comment above on Sept 22, 2010, where I realized my mistake. Melchizedek received his priesthood through the lineage of his fathers, even till Noah, [means my priesthood came down in time from Adam to Noah, my father]; from Noah till Enoch through the lineage of their fathers [means my priesthood lineage descended from Adam via Enoch to Noah, my father, through the lineage of their fathers]; for this priesthood was received from Enoch to Abel, who received the priesthood by the hand of his father Adam. The priesthood lineage is very clearly recorded: a descending pedigree lineage, anciently from the man Adam, to Abel his son,(who was a brother of Seth, the son of Adam: the lineage ancestry of Noah). COMMENT: Do not interpret ancient genealogy from the standpoint of modern genealogists, who do ascending research. Until the covenants were broken, all genealogies were descending. Abraham clearly states he received the records from the fathers. Apostle Bruce R. McConkie was wrong in his evaluation of the record. I guess Eldridge Cleaver must have been wrong about joining the LDS church. Didn't he realize how racist they are? -(just kidding, being sarcastic). After his stint with the Black Panthers, then his self-exile to Africa (corroborating with socialists and communists from USSR, Cuba, etc. ), he was highly disappointed in those realities and decided to come back and become a Republican as opposed to Democrat. Then, realizing that they were not the answer either, he investigated MANY churches. Upon meeting Cleon Skousen, he finally had decided to listen to what the "Mormons" had to say (previously thinking they were racist), and wanted to investigate further because he felt that of all religions, he claimed the Mormons were "different"; not materialistic in any way as a religion. It was, as he made mention, "the BEST thing for his people". He realized that the key to helping "his people" (as he stated) was not violence, Communism, the Dems' "social programs", or the GOP's "Self-help" theories. The key to "helping his people" as he states, from poverty and harsh economic circumstances was a "strong family unit, with values; led by righteous men and their wives". After a few years of study and prayer, he joined the Mormon church. He was not perfect (as no Mormons are), but when he passed away, he was in "good standing" with the church and its principles. Thanks for the comment, but this has nothing to do with the post or any comments on this thread. 1) vs. 32 indicates that those who have "this faith" (the faith of Enoch) "were translated and taken up into heaven,"
4) vs 36 Melchizedek was called "the king of heaven by his people." While it isn't explicit, the interpretation that Melchizedek was translated seems reasonable, but I can see what you are saying and recognize that there are other plausible interpretations. Didn't Jerusalem belong to the Descendants of Ham inhabit the City of Jerusalem before? According to the Hebrew Bible, the Jebusites were a Canaanite tribe who inhabited Jerusalem prior to its conquest by Joshua (11:3 and 12:10) or King David (2 Samuel 5:6-10). And the city was called Jebus before hand. Why would Shem live and rule a city that was the inheritance of his brother Ham?